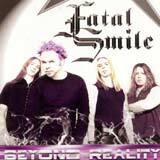 Beyond Reality is the debut album for the Swedish band, Fatal Smile. The band plays hard rock with some hints of classic heavy metal thrown in. The band includes in its list of influences Whitesnake, Metallica, and Black Sabbath. 1) The songs lack strong melodies. For me, this is an essential trait of an excellent hard rock album. In the case with Beyond Reality, the songs fail to distinguish themselves from one another and don't stick with you after the album is finished. I like the heavy vibe the songs carry, but the melodic quality seems to have been lost in the shuffle. 2) The harmony vocals are too thin. The band could add a lot more depth to the songs with thicker harmony vocals. Coupled with my first point above, I feel the songs would achieve a more "grand" feeling to them, which is missing on this album. As a result, I can only say that al ten tracks are good, no more and no less. No killer songs, but no duds to speak of either. I'm sure you will enjoy the music while listening to this CD, but the songs just don't beg to be played over and over again. All in all, this debut album shows some promise for Fatal Smile. However, the hard rock genre is becoming quite a populated field these days. Therefore, I think the band must work on making their songs more memorable for the listener in order to become a major player on the scene. Some key ingredients for success are already present: superb vocals, aggressive guitars, and clear production. With some work in the songwriting area that I described above, I think the band can take their music to the next level.